In spite of the chill in the weather it is warm enough to have every rain barrel full of water. One side of the hoophouse has the sides off, the rain gutter on, and the rain barrels in place and full! A few days of slow and steady rain means diverting the water inside the hoophouse onto all those vegetables. Most are closed tops, with a small hole that lines up with spots on the gutter where the water drops right in. A few have open tops and to be safe get a screen over them..so no falling in! This is the Homer made coldframe inside the hoophouse. The other day he pulled 150+ broccoli/cabbage/cauliflower out of here and planted them in the full beds. 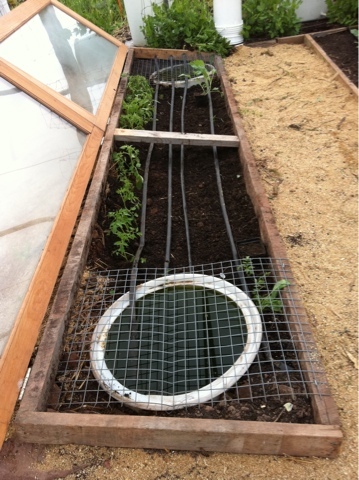 Then a total of 50 tomato plants were transplanted out of here and into individual holes with a bucket over each one. A real jump on the season, thanks to pieces our neighbor was discarding.